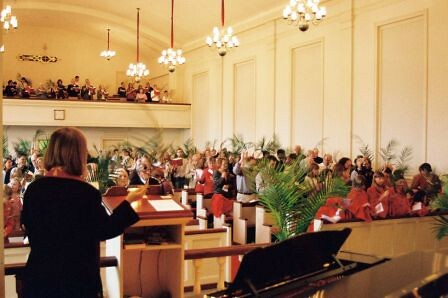 The First Congregational Church, United Church of Christ, of South Portland, Maine, has offered mission and ministries to the greater Portland community since 1733. We were established as the Second Parish of Falmouth, to serve the early European settlers on the south side of the Fore River. That was in the days when we were under the British flag, part of Massachusetts, and within the boundaries of Falmouth — later renamed Portland. Native peoples were in evidence, and block-houses were a familiar site. In 1734 our forbears built their first Meetinghouse (across modern-day Cottage Road in what is now the Mount Pleasant Cemetery). They called the Rev. Benjamin Allen as parson. “Where Go d and People Meet” since 1733. Today we are a large congregation with 750 adult members and a varied program. We’re also widely known as “The Church on Meetinghouse Hill,” to which many people in South Portland, Cape Elizabeth, Scarborough and Portland turn in their times of joy and need.